Dormer E0261/4 Spiral Point Taps, Steam Tempered Coating, UNC1/4, Full Length 2.1/2", Flute Length 0.5075", Shank Diameter 0.2550"
The Dormer MTT-X E026/MTT-X E036 powdered-metal steel spiral point tap has a round shank with a square end, black oxide finish, and a plug chamfer, and is used to create right-hand threads in a number of materials, with best performance in steel and stainless steel. It is available in two different ANSI thread specification standards: UNC (Unified Coarse) and UNF (Unified Fine). The spiral point of this tap (sometimes referred to as a “gun tap”) pushes chips ahead of the tool and the straight flutes reduce clogging. Both characteristics make it suitable for threading through holes (extending through the workpiece). The tap’s black oxide finish improves lubricity, resists corrosion, and will not chip or flake. It also helps to prevent buildup of welding materials on the tap’s cutting edge when working with iron and steel. A plug chamfer distributes cutting to ease tapping at the beginning of the hole and to maintain correct perpendicular alignment with the workpiece. Right-hand threads are designed to tighten when a head or nut is rotated clockwise (the most common threading direction). Powdered-metal steel offers performance that approaches that of solid carbide tools but with the toughness and shock-resistance of high-speed steel. The round shank with square end helps to minimize rotation in the tool holder. This tool can be used in machines, such as drill presses or lathes, or with hand tools such as tap wrenches. In the Dormer MTT-X E026 series, taps in machine screw sizes 2 to 12 have two flutes, taps with nominal diameters of 1/4“ to 3/8” are available with two or three flutes, taps with a nominal diameter of 7/16” have three flutes, taps with a nominal diameter of 1/2“ are available with two or three flutes, and those with nominal diameters of 9/16” to 1” have three flutes. In the MTT-X E036 series, taps in machine screw sizes 10 and 12 have two flutes, taps with nominal diameters of 1/4” to 3/8” are available with two or three flutes, taps with a nominal diameter of 7/16” have three flutes, those with a nominal diameter of 1/2” are available with two or three flutes, and those with nominal diameters of 9/16” to 1” have three flutes. All taps in both series have plug chamfers. 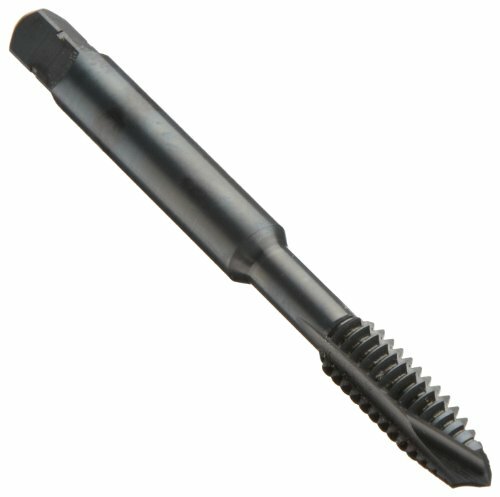 This tap conforms to ANSI standards and can create threads to a depth two-and-a-half times its diameter. It is suitable for the ANSI 3B tolerance class: 3B produces close-tolerance fasteners that resist loosening, as in aerospace applications. Taps produce internal threads in previously formed holes and can be used in machines (such as drill presses) or with hand tools. Common types of taps include hand taps, spiral point taps, spiral flute taps, thread forming taps, and pipe taps. Hand taps (straight-flute taps) collect chips in the straight flutes of the tool; spiral point taps push chips through holes ahead of the tool; and spiral flute taps pull chips back from the tip of the tool, up and out the hole. Thread forming taps, also known as cold forming taps, press rather than cut to create threads in a drilled hole, and no chips are created. Pipe taps create threads in pipes and pipe fittings. Each thread type designates a thread profile and each type is identified with an abbreviation. In the U.S. and Canada, the Unified Thread Standard is the dominant thread type, including UNC (Unified Coarse), UNF (Unified Fine), and NPT (National Pipe Taper) threads, among others. Dormer Pramet manufactures cutting tools under the following brands: Precision Twist Drill, Dormer, Union Butterfield and Pramet. The company has locations around the world, and provides tools adhering to ANSI, NAS, and DIN standards. View More In Spiral Point Taps. If you have any questions about this product by Dormer, contact us by completing and submitting the form below. If you are looking for a specif part number, please include it with your message.